Wellfleet Oysters are the Best in the World! 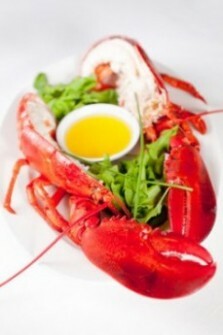 That is why one of the “guests of honor” for the Labor Day Holiday is the Wellfleet Oyster and fresh Maine Lobster. The late Howard Mitcham, a renowned chef that called Provincetown, Cape Cod home, called the Wellfleet Oyster the best in the world. In his book, entitled “Clams, Mussels and Oysters …” Mitcham wrote that the flavor of oysters varies widely from region to region. And as anyone who has eaten a raw Oyster knows, the flavor is complex. Oysters can be sweet, salty, earthy, or even melon. After last Saturday, two dozen Wellfleet Oysters later, we are in complete agreement with Mitcham that the Wellfleet Oyster is the most succulent, sweet oyster in the world. The clean, crisp, cold Cape Cod waters help produce a wonderful abundance of Wellfleet Oysters, and they are prized by locals and visitors alike. Interestingly, the Wellfleet Oyster is a transplant from Connecticut and the Chesapeake Bay. After Cape Cod oysters were nearly fished out in the 1800s, the Wellfleet locals introduced young southern oysters into their waters. The oysters were fattened up on sparkling clean river estuaries and then harvested and sold in Boston. This created the first aquaculture, as it is known today. The result was a lucrative success for the harvesters and a joy to the taste buds for the rest of us. Experts believe the cold water and the 12-foot tides combine to help make the Wellfleet oyster plump and sweet by providing them with ample, ocean-fresh plankton. Generations later, the flavor of a Wellfleet Oyster is as distinct as Cape Cod itself. Today, people all over the country order Wellfleet Oysters and have the oysters delivered right to their door as fresh as if they were just purchased from a Cape Cod market. Some people are intimidated by the challenge of opening an oyster. And everyone has their own special technique. But there some basic steps and advice that proves true. When selecting an oyster from a fish market bin, try to pick the ones that have a very hard shell as opposed to oysters with a brittle shell. A hard shell usually signifies a plump, healthy oyster inside. Make sure to keep the oysters cool when you bring them home. Get a good oyster knife as no other kind of knife will work. You will need one old work glove or a heavy hand towel to hold the oyster with. 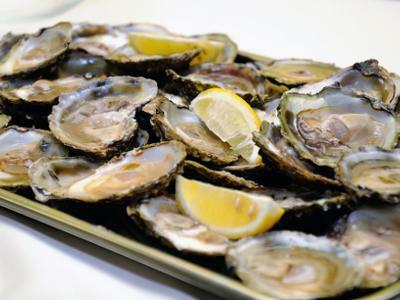 When ready to open, scrub the oysters under fresh running water to remove any sand but do not immerse them in water. Place them on ice or on a flat pan in a refrigerator for 30 minutes to allow them to rest. This will allow the oysters to relax and make them easier to open. Hold the oyster with flat side up. Place the knife at the small end of the oyster, or the heel. Press the knife into the heel and twist. If it is too hard to open, some folks will hold the oyster and knife vertically and then tap the base of the knife handle on a cutting board or stone. This drives the knife with a good nudge into the muscle and makes it easer to pop open the shell. Try not to spill the oyster juices. Once open, slice under the muscle to cut the oyster from the bottom shell and place the opened oyster shell on a plate of crushed ice. This keeps the oyster level and cold. Serve immediately. The traditional serving is with a side of fresh lemon, cocktail sauce and horseradish. A robust red wine compliments the complex flavor of the Wellfleet Oyster nicely. Most adults can eat a dozen or more, so be sure to order enough. Be sure to check out the Wellfleet Oysterfest in Wellfleet, MA October 14th and 15th.